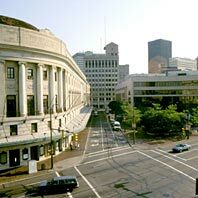 Eastman School of Music, located on Gibbs Street in the East End, is a part of the University of Rochester. It is a world-renowned music school that often holds free world-class concerts. Even if they're not free, they often cost as little as five or ten dollars. Concerts vary widely; for classical enthusiasts there are endless options. The Ying Quartet, winners of a Grammy for best crossover classical album, is in residence at Eastman and gives several concerts a year. 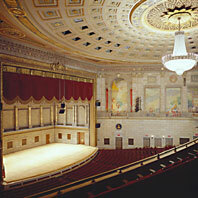 The vast majority of the musical performances take place in Kilbourn Hall, the Eastman Theater or the new Hatch Hall. 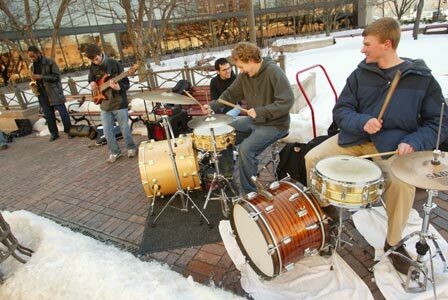 The jazz program at Eastman is arguably one of the best in the world and the school is a sponsor of the annual Rochester International Jazz Festival. Eastman is also known internationally for its promotion of new music and world music. Check out Musica Nova and Ossia concerts for new music. For world music, look up the world music concert series. Visit the concert calendar website for a complete listing of all upcoming events. Definitely check this place out; the students and faculty are really passionate about what they do here and are some of the best in the world at it. The ESM also sponsors the Eastman Community Music School which provides music instruction to non-academic students of all ages. The ESM used to be one of the co-producers of the Image, Movement, Sound festivals.